Diptyque floral candles- front: Choisya; Back row from left to right: Jasmine, Violette, and Muguet; and Top from left to right: the Choisya box and Aubepine (Hawthorn). 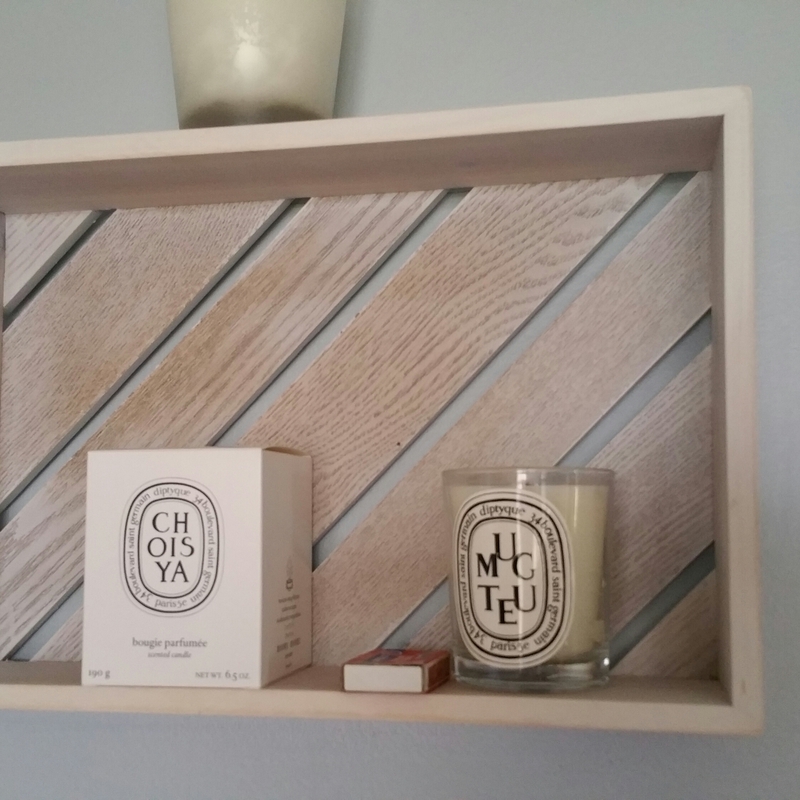 Even when I’m not writing about Diptyque candles I’m often thinking about them… Sometimes I’m figuring out how to get more. Or I’m smelling them, and dreaming about the ones I don’t have. Or gazing at the ones I do. Does this sound like an obsession? Huh. Actually, it really does. Oh well. So then let’s talk about a couple of florals from Diptyque. I recently brought home “Choisya” (Mexican Orange Blossom) and “Muguet” (Lily of the Valley). Honestly, it’s not like I particularly craved a mexican orange blossom- smelling candle, or one capturing the smell of Lilies of the Valley. But as I wanted to make my way through each of the Diptyque scent categories (see here: Diptyque reference page), I realized I had to tackle the florals sooner or later. Once I’ve conquered the whole garden I’ll do a floral category summation for you, but today let’s just look at two. So here I sit with Choisya, pondering the concept of an orange blossom, and a Mexican one at that. Do I smell some citrus in this candle? I think so. Yes, it’s either my imagination or there is a hint of orange in here. I can say more surely that this is a zesty smelling floral. When I say zesty I’m not talking about spices, herbs, or citrus peels. Instead it’s about a sharpness that pervades the floral smell. Have you ever mistakenly purchased a lotion or hand soap that you thought was going to smell like oranges but instead smells like flowers? It’s happened to me a few times. Later I would realize I failed to read the whole title of “orange blossom” and just saw the “orange” part. So imagine that sweet, round, smell of orange blossoms– got it? Good. Choisya does NOT smell like that. Choisya is a pointier floral that doesn’t feel classic, as do the smells of jasmine, rose, or violets. I imagine a lover of the floral category as a whole would enjoy this one, but for me it was a bit too… different. With florals I don’t really want to be adventurous. I prefer to do that with woody and oriental smells. So, I wouldn’t buy Choisya for myself again. But it’s not on my “dislike” list either (like Figuier is!). In other words, I’m not going to walk right back out of your house if I come in and you’re burning Choisya. While I’m rather sure I’ve never encountered a “choisya” in real life, I now know I’ve seen and smelled plenty of Lilies of the Valley. Before buying Muguet I was thinking that I had no idea how it would smell. But when I unwrapped this candle I immediately knew this flower. Where Choisya is sharp, Muguet is sweet and lighter, but a bit musky too. It’s funny that Diptyque’s website can be so unhelpful. Here is their description for Muguet: “Considered to be a good-luck charm, this symbol of spring livens its surrounding with its cheerful and sprightly appearance.” They’ve told us a bit about the flower and described it’s character, but they haven’t talked about how it smells. Maybe that’s because it’s really tough to describe the smell. My question, even before reading Diptyque’s description of Muguet, was going to be: how does one describe a floral fragrance without violating the basic rule of definitions, that you don’t use the name of it to describe itself? Wrapping up, here is something I’ve concluded about Diptyque florals: in the space between the last molecules of scent and the unscented, clean air, there is a note of something soapy. Could it be the wax? I suppose so. But I like to think instead that Diptyque purposefully engineered each and every scent to give us the very best of the best fragrance. Therefore, I believe it’s intentional. And for that I thank them, these Parisian perfumers. And that is why I keep coming back for more.